LINK group continues to implement socially responsible projects. For the third year in a row, the LINK Learning Foundation program, in cooperation with the City of Belgrade, has allocated 20 free training programs at our educational institutions, ITAcademy (i.e. LINK Academy in Romania), BusinessAcademy and InternetAcademy, amounting to around €40.000, to persons with disabilities. Out of the 20 free training programs, eight have been distributed in Serbia, and six in Bosnia and Herzegovina and Romania each. The ceremony at which the free training programs were handed out to recipients in Serbia took place at the City Assembly. 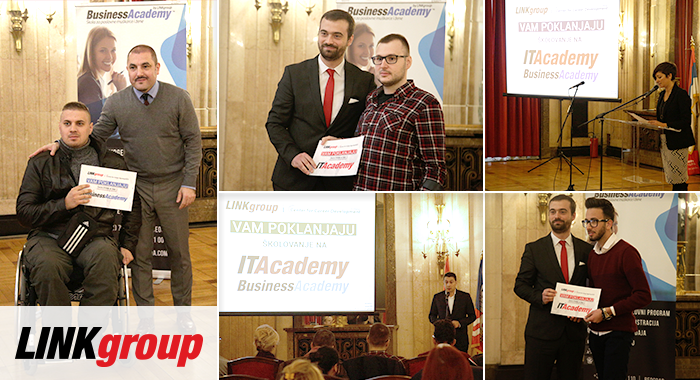 The vouchers for the online courses were handed out by ITAcademy manager Vuk Ninić and BusinessAcademy manager Goran Mitić, along with the member of the City Council Goran Petronijević. The City of Belgrade and the Republic of Serbia, together with the private sector, strive to remove barriers. However, the most important thing is for you to take matters into your own hands, as one mustn’t wait for a job to come – one must work on getting one. On that path, we will be a worthy partner to you. I wish you all plenty of luck and success, said Petronijević. Future ITAcademy and BusinessAcademy students were also motivated by students of acting from the Faculty of Contemporary Arts, one of LINK group’s educational institutions. Nikola Ugrinović, a student in the class of professor Božidar Đurović, and Jovana Todorović, a student in the class of professor Vida Ognjenović, recited the poems “If” by Rudyard Kipling, and “Prayer” by Bulat Okudzhava. The main goal of this campaign was to provide online access to practical knowledge and skills to people interested in developing skills in today’s most sought-after and profitable professions. The recipients wrote letters of motivation to explain they are the ones who should receive free training, and the free online courses went to those with the strongest motivation. At the reception at the City Assembly, the recipients were able to exchange their experiences, link up and share their business ambitions and ideas. Prior to the ceremony, Tanja Božić, Center for Career Development (CCD) coordinator, gave a presentation for the attendees. She presented the means of initiating and enhancing one’s career after finishing school, providing future students with valuable advice and guidelines. LINK group would like to congratulate all the recipients; we hope they will find the best possible way to use the benefits, knowledge and skills they are about to acquire at our educational institutions. We invite all the other applicants to apply for the next school year, and may they have the best of luck.